Rear derailleur. Missing the front derailleur. 3TTT Handlebar and stem. This is not a modification of the previous owner but it is a priori of the first handlebar of this type, Aero with the cables inside, the holes are very clean, without burrs. A SHIMANO 600 EX FRONT DERAILLEUR. DATE CODE IB=1984. A USEDSHIMANO 600 REAR DERAILLEUR. DATE CODE LC=1987. A USEDSHIMANO 600 ULTEGRA REAR DERAILLEUR. DATE CODE NE=1989. A USEDSHIMANO 600 REAR DERAILLEUR. DATE CODE KC=1986. CAMBIO PLATOS SHIMANO 600, BUEN ESTADO. 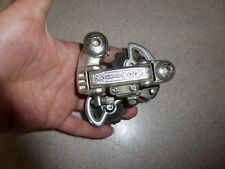 A SHIMANO 600 UNIGLIDE FRONT DERAILLEUR. USED & IN VERY GOOD CONDITION. A SHIMANO 600 ULTEGRA TRICOLOR FRONT DERAILLEUR. DATE CODE LI=1987. 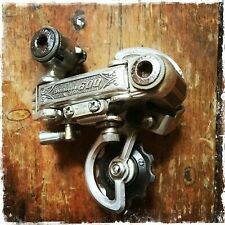 Shimano 600 rear derailleur in good used condition, cleaned and polished ready for use. A USEDSHIMANO 600 REAR DERAILLEUR. DATE CODE KE=1986. A USEDSHIMANO 600 ULTEGRA TRICOLOR REAR DERAILLEUR. DATE CODE OL=1990. A SHIMANO 600 ULTEGRA TRICOLOR FRONT DERAILLEUR. DATE CODE Q=1992. MODEL FD-6401. A USEDSHIMANO 600 REAR DERAILLEUR. DATE CODE KG=1986. The plastic plate containing the limit screws is cracked near the “H” end, but this doesn’t affect the function of the screws at all. (crack can be seen on images). VINTAGE SHIMANO 600 ULTEGRA TRICOLOR FD-6401 dérailleur avant. 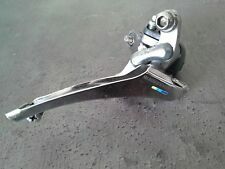 Shimano FD-6401 front derailleur in good used condition cleaned, lightly polished ready for use. I will be away from 27th April till 4th May, all item will be dispatch after then. VINTAGE SHIMANO 600 ULTEGRA TRICOLOR FD -6401 dérailleur avant. 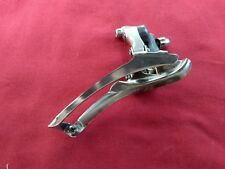 Shimano FD-6401 front derailleur in good used working condition cleaned, lightly polished ready for use. Look at the pictures closely. The item you see there is the one you will receive. A SHIMANO 600 EX FRONT DERAILLEUR. DATE CODE KC=1986. 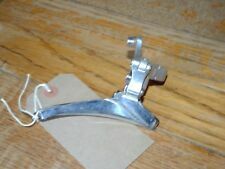 VINTAGE SHIMANO 600 ULTEGRA TRICOLOR FD-6401 FRONT DERAILLEUR. 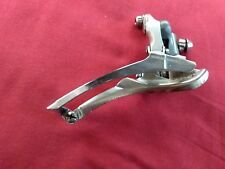 VINTAGE SHIMANO 600 ULTEGRA TRICOLOR FD-6401FRONT DERAILLEUR.